﻿ Water: The Next Climate Negotiation Tool? Water: The Next Climate Negotiation Tool? When the dust settled at the COP15 in Copenhagen, participating parties failed to reach a formal climate change agreement and old divisions between developed and developing countries intensified. Despite such setbacks, there may be a natural building block in formal climate change negotiations between the north and south in the future: water. Luis Alberto Moreno, president of the Inter-American Development Bank, argues in a recent LA Times op-ed that economic interdependence and, more concretely, basic survival hinge on water in both developed and developing countries alike, most especially in Latin America. With 31 percent of the world’s freshwater resources, Latin America enjoys a competitive advantage in agriculture and energy. But recently, drought has taken its toll. Repercussions were most acutely felt in Argentina in 2008, when 1.5 million head of cattle died and half its wheat crop was ruined. Meanwhile, hydroelectric output in the most populous part of Chile plunged by 34 percent and water-dependent states like Venezuela, Ecuador, Colombia, Paraguay, and Mexico rationed water, cut power, or both. Water’s importance in the region is obvious, but why should developed countries care about it when negotiating a climate deal? The simplest answer, according to Moreno, is that developed countries can invest in projects that resolve near-term, climate-related problems such as water supply and sanitation as they look for ways to spend the billions in aid they have just pledged for climate adaptation in the developing world. And many international donors, particularly the UN Development Programme, World Bank, and World Wildlife Fund already have invested millions of dollars towards water management and sanitation adaptation projects. While it may seem that Latin America’s water problems are not pressing, it is undeniable that if not properly managed, essential components of the region—such as the vital agricultural economy, the health of the population, and political and economic stability—may be in jeopardy. 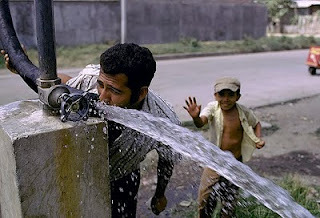 Photo: Man drinking water from a pipe in Ecuador. Courtesy Edwin Huffman and the World Bank.